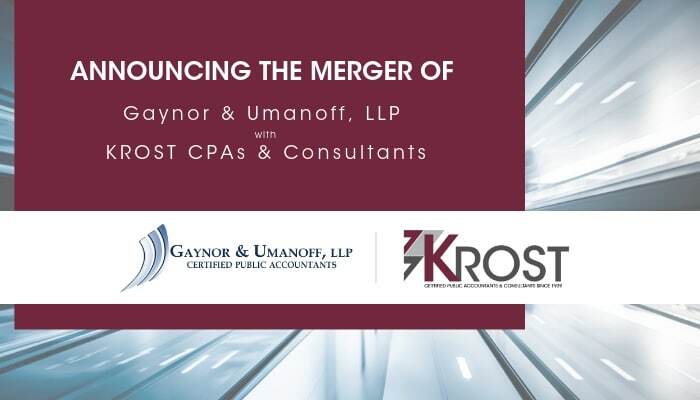 We are pleased to announce the merger of Gaynor & Umanoff, LLP with KROST CPAs and Consultants effective January 1, 2019. This new and exciting change will elevate our service model while maintaining our commitment to you, our clients. Two principals and two directors will join our leadership team, as well as 9 associates, growing the practice to a total of 170 team members firm-wide. The new management and staff will remain at the 6100 Center Drive office. Now with four locations around the Greater Los Angeles area, we have offices in Pasadena, Woodland Hills, and Valencia in addition to the new west side space. With change comes opportunity, and our hope is that the new office location and additional team members will provide us with the ability to serve you better through increased resources and expertise. We will have more information to share with you in the coming months, but in the meantime, we hope you will join us in welcoming our new principals, directors, and staff. Richard is a Principal at KROST. His emphasis is individual, estate and trust tax compliance and planning and estate administration. Richard also serves as trustee for numerous clients. Richard earned his Bachelor of Science and Master of Business Administration from the State University of New York at Buffalo. His graduate courses included successful completion of The Professional Accounting Option. Prior to joining KROST in 2019, Richard was the managing partner of Gaynor & Umanoff, LLP in their Beverly Hills and West Los Angeles offices. Richard’s career spans 40 years with a concentration in taxation. Chris is a Principal at KROST. His level of expertise ranges from retirement planning to tax controversy. Chris has successfully performed hundreds of tax audits during his career. Chris earned his undergraduate degree in political science at UCLA and then finished his formal education with a Master of Science in Accounting at California State University, Northridge. Prior to joining KROST in 2019, Chris was the Partner at Gaynor & Umanoff, LLP. Brad is a Tax Director at KROST. Brad has over 20 years of experience providing tax advice, projection, and compliance services to clients in a variety of different businesses and industries. His areas of focus include high net worth individuals and their closely held businesses, including athletes, entertainers, service professionals, and owners/operators of real estate including like-kind exchanges. Robert (Bob) is a Tax Director at KROST. Bob has 40 years of experience providing tax advice and compliance services to clients in a variety of different businesses and industries. His areas of focus include high net worth individuals and their closely held businesses; entity selection; real estate; S corporations; buying and selling a business; tax controversy; and international taxation. Elvira is a Tax Manager at KROST. Elvira has 25 years of Accounting, Financial and Taxation experience in both public accounting and private industry. She has been in the public accounting profession for over 11 years. Her areas of focus include tax planning, tax compliance, and financial reporting for individuals and their closely held businesses, partnerships, corporations, and trusts.